Twenty years ago, retirement was a time to look forward to and savor. But, today, we live in uncertain times. So, for most working adults, retirement has become very complex—requiring years of planning, a well-thought-out strategy, and a phase to be put off as much as possible. We’re living more years in retirement. Why? Company-sponsored pensions have all but become extinct. Thanks to medical advances and healthier lifestyles, people are living longer. In the early 20th century, life expectancy was 47.3 years vs. today’s life span of nearly 79 years.1 According to data from the Social Security Administration, a man who lives to 65 will live on average to age 84, while women of the same age should live to age 86.2 Or course, this is good news; but we need to be prepared for it. The truth about Social Security. And if you believe that Social Security will be there to support you, think again. For retirees in 2013, if you retire at the full age of 66, your maximum monthly benefit is $2,5333—not enough for many of you to live comfortably. While there are no easy solutions, life insurance can guarantee4 the protection of your loved ones and also supplement your retirement savings5 if the death benefit is no longer needed. Life insurance’s primary purpose is to deliver death benefit protection, which can provide a generally tax-free legacy to your loved ones. But permanent life insurance also carries “living” benefits. Your policy earns cash value that accumulates tax deferred. This means you do not pay taxes on any of the accumulation within the policy. Additionally, you can access that money generally tax-free through policy loans.5 This cash value can be used to fund college expenses, a small business loan, or any other anticipated or unexpected event. In addition to the death benefit protection, the cash value of permanent life insurance can also be used to supplement your retirement income. As such, it can be a vital piece of the complex puzzle of retirement planning. 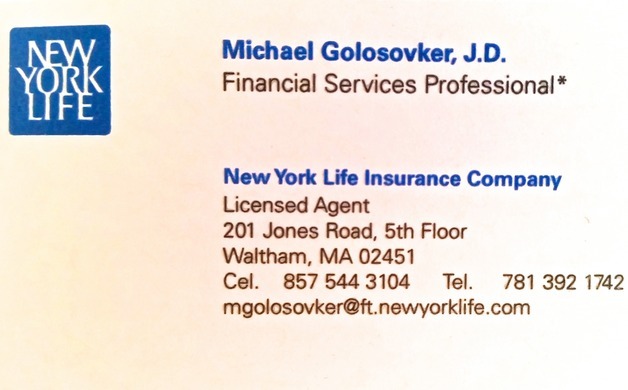 This educational third-party article is provided as a courtesy by Michael Golosovker, Agent, New York Life Insurance Company. To learn more about the information or topics discussed, please contact Michael Golosovker at 857-544-3104 or mgolosovker@ft.newyorklife.com. 1Centers for Disease Control and Prevention, “Deaths: Preliminary Data for 2011,” Donna L. Hoyert, PhD, and Jiaquan Xu, MD, October 10, 2012. 3U.S. Social Security Administration, “Maximum Social Security Retirement Benefit,” March 9, 2012.